Pilates is lately one of the most frequent fitness, practiced by common people or celebrities. It is an exercise system that helps on improving muscle strength, flexibility and body awareness. It also helps on breathing, balance and coordination of the body. There are a series of controlled movements performed on the floor or on specially resistance apparatus like the Cadillac, the Spine Corrector, Wunda chair, Reformer and Ladder Barrel. Pilates is different from jogging, cardio exercises is more a resistance exercise. The key elements of this discipline are spinal alignment and core muscle strength. During your exercises your instructor will teach you to concentrate deeply on your core muscles (abdomen, hips, pelvis and spine), on your breath and on the quality of the movements. All is about “contrology” called by Joseph Pilates, a total control and coordination of body, spirit and mind. Pilates was created in 1920s, in Germany by the physical trainer Joseph Pilates. Pilates first was practiced by soldiers returning from war to heal their pains and strengthen their bodies. According to Joseph mind and physical health are closely related. Even that during years pilates was enriched and modified with new poses or exercises, the key elements are the same as Joseph Pilates taught first. There are “classical pilates” and “modern pilates” which differ from each other depending on how instructors offer it. There are gyms, physiotherapy rooms, community centres and schools where you can practice pilates. Control or “contrology” is about muscle control and contraction. Concentration is very important for right movements. Concentration is strongly related with control. Precision is essential to profit the benefits of these movements. Flow of movement creating the appropriate transitions from one exercise to another. Centering is important to control your body. It’s like a powerhouse where all movements start. Breathing is related with blood circulation. A full inhale and exhale is the key of doing pilates. Coordinating properly all these principles help you doing pilates and profit from its benefits. Improve flexibility, get long and lean muscles is what pilates do compared to other exercises that build short and temporary muscles. It helps on flexibility and elasticity of muscles, strengthening them and being less prone of injury. As we said pilates movements work on body and mind. Following the six principles you execute properly the exercises and not only your muscles benefit from this but also mind and spirit by stress relieving. 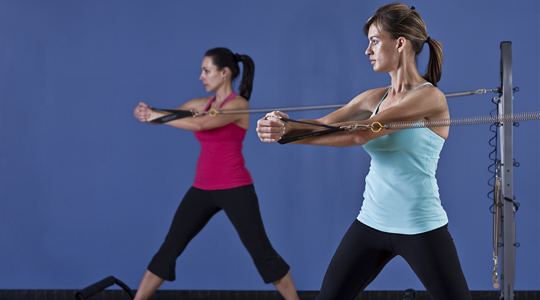 Pilates improve body awareness by coordinating mind and body movements all day long. It becomes part of your daily lifestyle by correcting wrong postures and being aware for what is good or bad for your body. Flat abdominals, strong core and back are the most wanted results from every workout and from pilates you can reach them. Pilates helps on weight loss of course combined with proper diet and nutrition. As in other workouts you do burn calories but if you don’t calculate what you eat don’t expect miracles. But pilates is not for everyone. About 50% of adults experience back pain and they think that pilates can resolve their problem. But without finding the reason of your back pain from a proffesionist or physician, don’t practice pilates because it can worsen it. Some of celebrities that practice pilates include Amanda Seyfried, Cameron Diaz, Mandy Moore, Megan Fox, Vanessa Williams etc who combine it with other workouts and a balanced diet to look amazing in the red carpet.